In episode 6 of Ultimate Processes by Insight TV you get a behind the scenes look at the making of one of the SAR AW101s being made for Norway. This series aircraft will be the most advanced rescue helicopters in the world when completed. 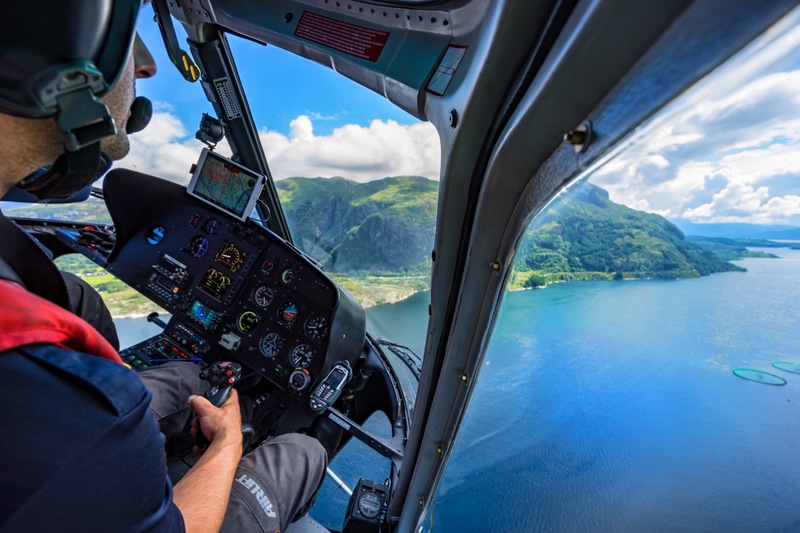 The show also sheds some light on the basic principles of helicopter flight. Click the image to be forwarded to the episode. Using a flight risk assessment tools is a great way of making flight crew and operations depts. aware of the risk level associated with a flight or series of flights. The concept is to run through a list prior to flight of items given a predetermined value, then seeing what it all adds up to. The forms are usually customizable to allow each operator to set the various values and alert levels for the total sum. Depending on the sum a flight may require supervisor approval or reassessment. This will keep you ahead the aircraft in terms of what risks may be lurking and make you aware of the expected risk level. The items on the list may include crew composition and experience, crew rest, Wx conditions, airport environment, MEL-items and so on. The list can be modified to suit any operation be it airline long-haul or helicopter external load operations. I would really recommend those of you who are not familiar with the concept to check it out. There are many available solutions out there, many are free, so google it an see what you can find. Last year we spent a good couple of months trying to renew our chart subscriptions for our fleet of helicopters utilizing the Jeppesen Mobile FD app on iOS. Not the Jeppesen Mobile FliteDeck VFR app mind you, but the one with the charts (great job naming them to avoid confusion btw). We had previously bought the subscriptions from a local retailer, but we felt it would be easier to buy directly from Jeppesen, since all we need is an activation key to activate the relevant chart subscription. Foolishly enough we believed this would be fairly easy in this day and age. Especially since all the subscriptions were listed on our online customer account. They were all listed there quite neatly, with a start date, and an expiry date. I figured we could click on a renew button on each of them, add our credit card details, and we’d be set for another 12 months. That was not the case though. There was a link above the list to renew services about to expire. I clicked that, thinking I’d be home free. Not so much though. In order to renew I needed an invoice I didn’t have, and that I wouldn’t receive. We contacted customer service to ask them how we could renew our electronic chart service. After about 30 e-mails back and forth I came to the conclusion that if it takes this volume of correspondance to answer a simle question, Jeppesen must have one of the biggest customer service departments in the world, good for you! Bad for us though, since after this lengthy period of sending e-mails, we were no closer to renewing the subscriptions. Ok, I thought, I’ll head online to Jeppesen online(JeppDirect) to order new subscriptions from there. No luck. Finding the correct area coverage was impossible. We sent customer service a new e-mail, this time trying to more or less say “we have money, you have a product, sell it to us please”. Still no joy. Sick and tired of it all we went back to the local retailer and bought new hardcopies with the magical activation codes on the back, then threw away the DVD’s (we only want the codes). At the same time we swore to do everything in our power to rid us of our Jeppesen dependency. The only backside to this is that we actually like your product, it is just that you are really quite terrible at selling it. That takes us to today. Our subscriptions are about to expire, and filled with optimism that Jeppesen has probably improved it’s online service in the last 12 months, we log in, only to be let down again. Ok, I figure, I’ll go to JeppDirect and buy from there, at least that HAS to have been improved in the last year. Bear with me on my quest through JeppDirect to buy new electronic charts for Scandinavia. I hit charts, and since this is a mobile service, I hit Mobile FliteDeck VFR (I know technically I need Jeppesen Mobile FD, but there is no such option, and I tried all other options for good measure). This brings me to the page for the Mobile FliteDeck VFR app, which I have no interest in. By a strike of luck I am able to find a link to the Mobile FliteDeck app. Finally! I scroll down and find “Purchase Coverages”, with a big green “Buy Now” button at the bottom. They did it, they improved since last year, I think to myself! When that button takes me back to the JeppDirect frontpage I realize I must be trapped in one of the nine levels of Jeppesen Hell. I search “Scandinavia electronic” and get one hit…on charts for all of Europe…a slight overkill seeing as we like it here in Norway, and very rarely visit our neighboring countries. One thing is for sure, if Netflix had made it this hard for their customers to renew their monthly subscription, they would be bankrupt a long time ago. Instead they have made it so easy for us to get access to their content, that we hardly notice the process at all. Again we are in a postion where we want your product, we have the money, but for some reason you do not want to sell it to us. We’re sorry if we have done anything in the past to hurt your feelings, Jeppesen, but we hope we can make up and become friends again. For the rest of you, feel free to support my post to Jeppesen by liking it here!